Hinckley Island Hotel01455 631122 (opt 3)work Conference residential venueHinckley Island boasts 362 contemporary bedrooms & 23 dedicated event rooms catering for 6 - 450 delegates. Hinckley Island Hotel is the largest residential conference hotel in the East Midlands where over 362 delegates can meet, eat and sleep. 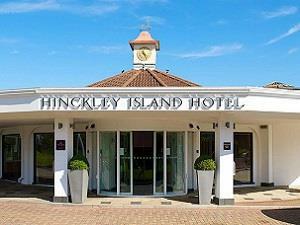 Hinckley Island boasts 362 contemporary bedrooms & 23 dedicated event rooms catering for 6 - 450 delegates. A superb hotel which has seen over £4 million in investment over recent years to further enhance the modern facilities. 362 bedrooms and 32 meeting rooms, catering for up to 400 guests in the largest event room. Easy access to the Midlands via M69 and M6 Motorways on 30 minutes from the NEC. A superb hotel which has seen over 4 million in investment over recent years to further enhance the modern facilities. 362 bedrooms and 32 meeting rooms, catering for up to 400 guests in the largest event room. Easy access to the Midlands via M69 and M6 Motorways on 30 minutes from the NEC. With a dedicated service and commitment to acheive excellent standards, whilst delivering memorable meetings and events for all clients. As the winner of the Leicester & Leicestershire Excellence In Tourism Award 2012 in the Access for All Category we are passionate about making our hotel an accessible place for all. We have accessible bedrooms with wetroom bathrooms, a hearing loop on site, provide anti-allergy bedding on request and have deafgard pillows & reading glasses available for guest's use. If you have any specific questions regarding accessibility please do not hesitate to contact us. From the North & East – Take Junction 21 of the M1 onto the M69. Exit at the second junction which is junction 1 signposted Hinckley/Milton Keynes A5. Turn left at the slip road onto the A5 and you will find the hotel 300 metres on the left. From the West – Take Junction 2 of the M6 and follow signs to the M69 north. Leave at the first junction which is junction 1 signposted Hinckley/Milton Keynes A5. At the bottom of the slip roads, take the 4th exit onto the A5 to Milton Keynes and you will find the hotel 300 metres on the left.